If you’re looking for a little bit of sweetness for your sweet tooth, and a little bit of spice for your wilder taste buds, then this roasted rosemary pecans recipe is sure to hit the mark. There is something magical about when the two flavors and sweet and spicy are perfectly combined. Who knew that they would compliment each other so well? The first bite gets your taste buds primed for that brown sugar flavor, and then it’s quickly followed up with the smooth and slow burn of that dash of cayenne pepper. It’s like a perfect little tasty match made in heaven. Not only does this recipe scream holiday fun, it’s a great snack to make for all your year-round snacking needs as well. These Sweet and Spicy Rosemary Pecans stay delicious for a week after they are made, so making them a few days ahead of time for a road trip is a great idea! And think ahead to the holiday season as well. Making up a batch of these pecans are a great way to give a tasty homemade gift that is certain to be unique, and delicious! If you are looking for a little more sweetness, then all you need to do is add a little more sugar and a little less cayenne pepper. Or on the flip side, if you want to breathe fire after eating one of these pecans, pour on that cayenne pepper and just have a little dab of sugar. Tickle your taste buds with your preference with this fun and delicious recipe! Make certain to make up an extra batch just in case because once you taste one, you’ll be hooked and wanting more! 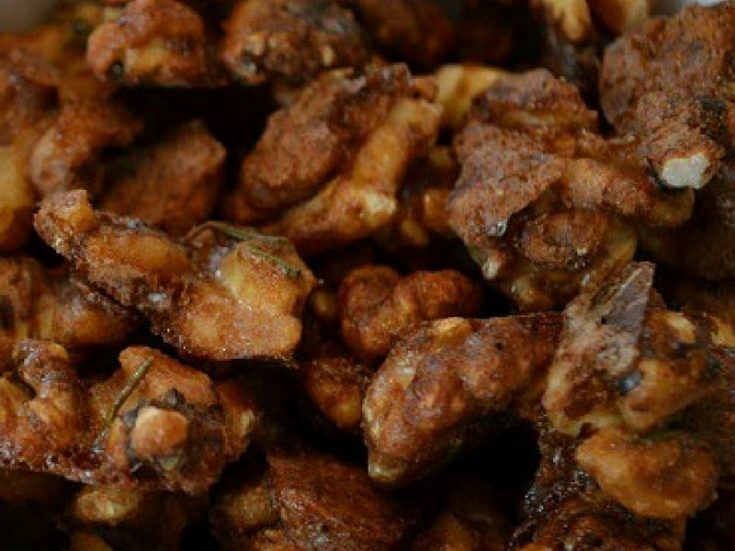 Tickle your taste buds with this fun and delicious, sweet and spicy rosemary nuts recipe! Mix together the brown sugar, salt, rosemary, and cayenne pepper in a small bowl. In a larger bowl, mix the egg whites together. Mix the walnuts in egg whites until they are all coated. Add the sugar mixture and mix well, until the mixture is evenly dispersed amongst all of the pecans . Spread on a baking sheet lined with parchment paper and bake about 25 minutes. Remove from oven and cool for a few minutes, then transfer to a plastic or glass container. These will keep in an airtight container for about a week. I used pecans for my recipe, but you can make this recipe with other nuts as well: give it a try with almonds, walnuts or mixed nuts. You can also use other spices. I love the rosemary, but you can try oregano, thyme or sage. And instead of brown sugar, you can use honey. So many options! Have fun experimenting with your own favorite herbs and spices.